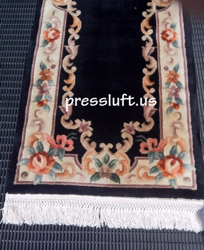 Our primary objective with most rug repairs is to prevent further damage to the rug and keep the rug functional. Quality rug repairs require skill, accurate fiber identification as well as comprehensive knowledge of rug construction. Years of practice results in quality rug repairs! We require that all rugs be cleaned before we address repairs. 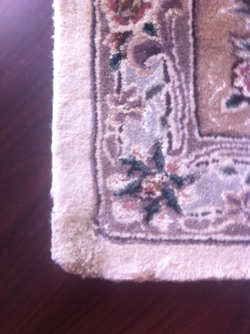 It is critical that rug repairs are as impeccable as possible as improperly repaired rugs may decrease in value. Our knowledge of rug construction, including fiber identification and the selection of appropriate replacement fringes and yarns will insure correctness. With all rug repairs we strive to match the original fiber and dyes however there is no guarantee that we can locate a perfect match. Our most common rug repairs include overcast stitching the selvages and ends, replacing fringes, spot dyeing and rug patch inserts. A very common request is for us to remove or trim old worn fringes. This instantly revives the look of the rug often making it look new again. 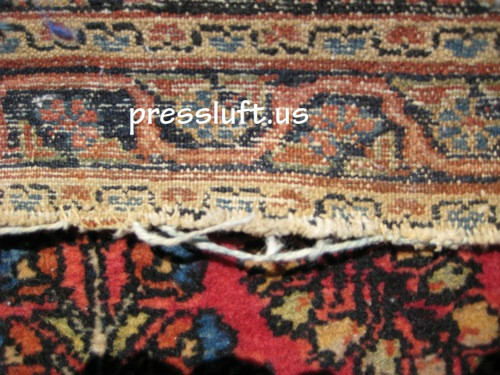 These types of rug repairs work great on nice machine made rugs (Karastan) as well as tufted Chinese rugs. 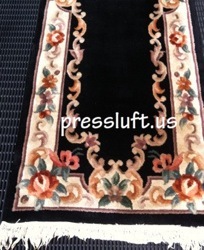 We will assist the rug owner with the best match of new fringes for their rug. Overcast stitching is frequently needed on the selvages (sides). The selvages are prone to vacuum damage, wear damage and insect damage. Exposed cords like those in the photo above, will eventually break and the rug will unravel if not repaired. An overcast stitch is used to cover the exposed cords & prevent the rug from continuing to unravel. Contemporary Pakistani Rugs are produced with multiple rugs woven on one loom. After the weaving is complete the rugs are separated by cutting the weft yarns. 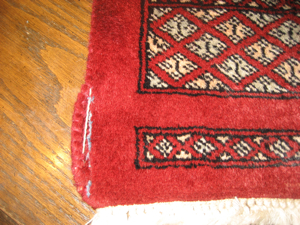 A fake side is stitched to create finish on the sides of adjacent rugs but the rugs do not have a warp cord over which the weft yarns should be wrapped. This creates a major structural flaw. Two common problems arise from this. 1-the side without the warp cord comes off very easily. Just normal vacuuming or foot traffic can pull the fake sides away from the rug. 2-When the sides pull away the rug will begin to fall apart as it is not connected to anything. The repair can be affordable if made soon after the tear. We see many Pakistani Bohkaras, Contemporary Persian Tabriz as well as some rugs from India with the same problem. Most rugs have white cotton fringes, some have have wool or silk. Some rug owners like the look of the fringe on their rugs and skillfully keep them looking great by combing or brushing them straight periodically. Others dislike them primarily for maintenance reasons. If your your has fringes save your fringes by keeping them from tangling and keep the vacuum from tearing or eating them by vacuuming side to side instead of end to end. The fringe on hand woven or hand knotted rugs is the foundation fibers of the rug. It is the warp yarns that run from one end of the rug to other. The warp yarns are then laced with the side yarns as well as knots to create the body of the rug. When fringes wear out…and they will… new manufactured fringes can be hand sewn on to the rug. It is proper for the original fringe to be cut short and new fringe to be attached over the remaining fringe thus preventing the foundation of your rug from unraveling. 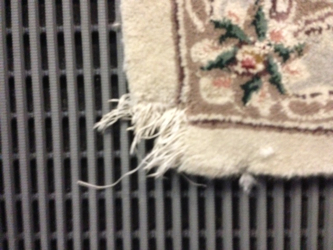 We can replace or remove fringes on newer rugs. We selected fringes to best match the original fringe on this machine made rug then we attached the new fringe insert by hand.